A new microscopic imaging system is revealing a never-before-seen view of the underwater world. Researchers from Scripps Institution of Oceanography at the University of California San Diego have designed and built a diver-operated underwater microscope to study millimeter-scale processes as they naturally occur on the seafloor. The research team observed coral turf wars, coral polyp “kissing,” and much more using the new microscopic technology. Many important biological processes in the ocean take place at microscopic scales, but when scientists remove organisms from their native habitats to study them in the lab, much of the information and its context are lost. In a quest to overcome this challenge, Scripps oceanographer Jules Jaffe and his team have developed a new type of underwater microscope to image marine microorganisms in their natural settings without disturbing them. 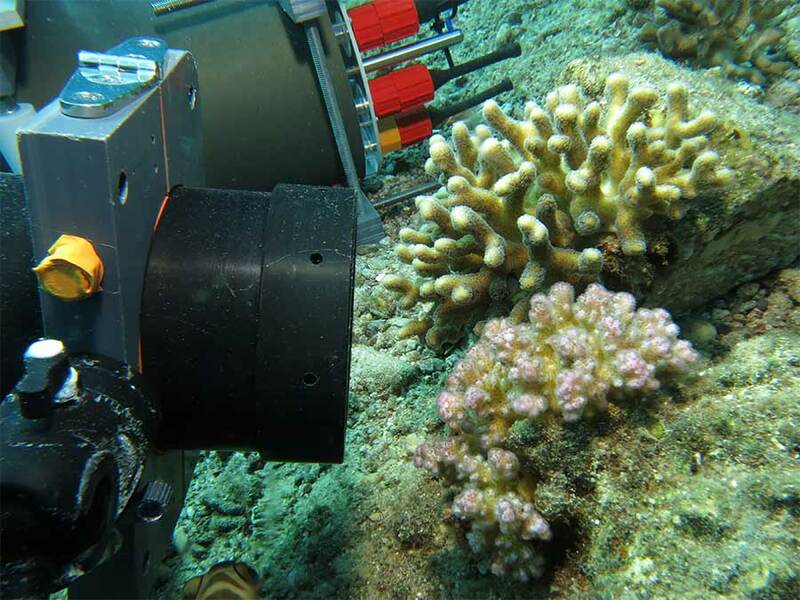 The Benthic Underwater Microscope, or BUM, is a two-part system–an underwater computer with a diver interface tethered to a microscopic imaging unit–to study marine subjects at nearly micron resolution. The instrument has a high magnification lens, a ring of focused LED lights for fast exposures, fluorescence imaging capabilities, and a flexible tunable lens, similar to the human eye, to change focus for viewing structures in 3-D. The motivation for building the imaging system was to better understand the many ecological processes taking place underwater on a microscopic scale, according to the Scripps researchers. “To understand the evolution of the dynamic processes taking place in the ocean, we need to observe them at the appropriate scale,” said Jaffe, the senior author of the study, and head of the Jaffe Laboratory for Underwater Imaging at Scripps. 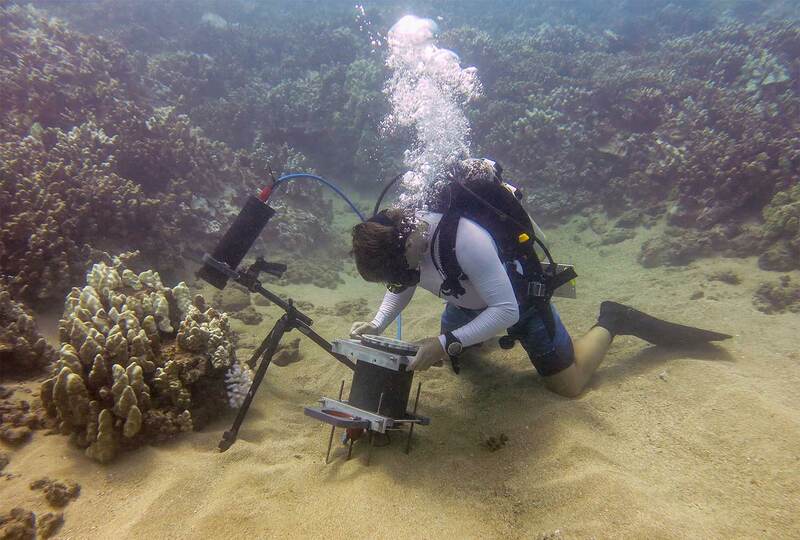 To test the new technology’s ability to capture small-scale processes taking place underwater, the researchers used the imaging system to view millimeter-sized coral polyps off the coast of Israel in the Red Sea, and off Maui, Hawaii. During experiments in the Red Sea, the researchers set up the BUM to capture the interactions of two corals of different species placed close to each other. The images revealed micro-scale processes in which corals emit string-like filaments that secrete enzymes from their stomach cavity to wage a chemical turf battle to destroy the tissue of other species in a competition for seafloor space. Yet, when the researchers placed corals of the same species next to each other, they did not eject these gastric fluids. “They can recognize friend versus foe,” said Mullen. Next, the researchers deployed the instrument off Maui following one of the largest coral-bleaching events on record, which occurs when single-celled algae that live inside the coral polyp eject themselves during high ocean temperature events. Recently bleached corals are still alive, but in their weakened state can be rapidly invaded and overgrown by filamentous turf algae. Using the microscope, the research team observed a previously unreported honeycomb pattern of initial algal colonization and growth in areas between the individual coral polyps during coral bleaching. These findings provide insight into a process that Scripps marine ecologist Jennifer Smith, a co-author of the study, called the “succession of algae” where small filamentous algae initially settle on the ridges between coral polyps and eventually smother the living tissue. The images showed that algae are able to actively overgrow living corals during a bleaching event. “This instrument is a part of a new trend in ocean research to bring the lab to the ocean, instead of bringing the ocean to the lab,” said study co-lead author Tali Treibitz, a former Scripps postdoctoral researcher now at the University of Haifa’s Charney School of Marine Science. Jaffe and Mullen are now preparing the instrument to take pictures of microscopic particles in the water near the coral’s surface to study how the flow of water over corals allows them to exchange the necessary gases to breathe. The W.M. Keck Foundation, National Science Foundation, Link Foundation for Ocean Engineering, and U.S.-Israel Binational Science Foundation supported the instrument development and research.